New licks or safe licks? Here's a question for you - is it a good idea to try out new licks in a performing scenario if they don't sound as great as your tried and tested stock licks? Furthermore, will they lessen your musical skills in the eyes of an audience? To my mind, much of the answer lies in the scenario. If it's a paying gig of some importance, you need to be on your best appearance so well honed solos are the order of the day. Of course, new licks are possible but they'll be predetermined earlier during practice, in the same way as, say, you'd deal with a newly learnt Brian May or Slash solo. If it's a less formal jam scenario though, push yourself; a developing improviser should have the opportunity to trial and error material without incrimination. So ideally, we all practice improvising, right? 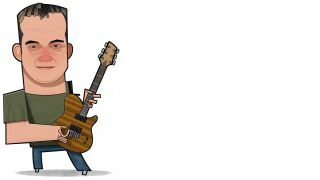 Not quite - over the past year we at Guitar Techniques magazine have met many guitarists that say they practice everything but improvising! Why is this? Is it because improvising seems of less worth, purely relegated to 'in the moment' situations? Bottom-line, to be a good improviser one needs to keep improvising, drawing on stock and new licks that use your ever expanding technical and scalic vocabulary. So here's a plan: grab a favourite bluesy backing track (or one of the MP3 backing tracks from GT's accompanying CD) and improvise a solo over it every night for a month. It's a big ask but the same backing will make you dig deep; the backing isn't changing so your improvising has to in order to stave off boredom! As you may appreciate, the options are endless so add new handcuffs for yourself. Ideally, chart your progress over several months and see how you develop - we'd love to hear how you get on!